About 35 year ago Trudeau senior created Petro-Canada by nationalizing BP assets and the assets of other producers, and now Trudeau junior has nationalized a pipeline and has backed another. At least Trudeau is socializing oil for Canadians......better than the BC Liberals socializing our Natural Gas for Petronas which is owned/for the benefit of Malaysia taxpayers. ^ I also think Petro-Can ended up being sold off for a tidy profit? But its ok now that Petronas came back and took a 30% stake in this current play? Edited by rjag, 01 June 2018 - 06:07 AM. Anti-Trans Mountain protesters rappelled from Vancouver’s Ironworkers Memorial Bridge as part of an aerial blockade of oil-tanker traffic on Tuesday. Seven climbers suspended themselves from the span connecting North Vancouver and Vancouver as part of the protest, according to Greenpeace Canada. Five others were in place on the bridge to help support the seven climbers. “The blockade is an act of peaceful resistance to the Trans Mountain Expansion pipeline and tanker project,” read a Greenpeace statement shared Tuesday morning. 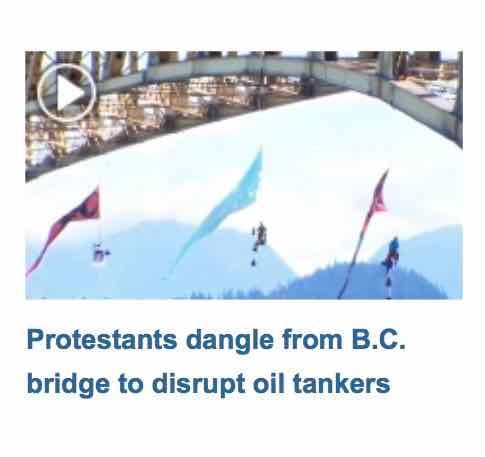 Too bad their protest wasn't non-sectarian, hey CTV? Meanwhile, TM construction activities continue. BC government is actively trying to handcuff the AB economy by stopping TMX. AB threatens to turn off the taps. BC takes AB to court to fight the constitutionality of AB potentially shutting off the oil and fuels supply to BC. BC then has to go on record in court filings about how critical Alberta oil actually is to BC's economy and how crushing it would be if the supply of diesel and gasoline was shut off. BC took Albert to court over its planned legislation granting it powers to cut the flow of oil to BC, ...but we took Alberta to court prior to Alberta actually enacting Bill 12 (the bill in question), so there is literally nothing to go to court over, and the judge dismissed the case. Yeah, so funny. BC is a laughingstock. Between the NDP cosying up to Horgan's buddy Jay Inslee to vilify TM while Washington imports massive amounts of crude through our shared Salish Sea and BC proclaiming in a court affidavit just how reliant we are on AB fuels - we just look ridiculous. Edited by jonny, 24 February 2019 - 05:09 PM. And someone just grabbed the mayor’s beer. Coal is the province’s number one export commodity, with $3.32 billion of coal mined in 2016. Much of this is metallurgical coal, which is exported to Asia for the making of steel. In recent years, however, Vancouver’s coal ports have also accommodated a massive increase in exports of thermal coal, which is used for the production of electricity. In 2008, only 4.4 million tonnes of Vancouver’s coal exports could be called non-metallurgical. By 2017, this had more than doubled to 11.3 million tonnes. Controversially, almost all of this thermal coal is coming from the United States. As lawmakers in Washington and Oregon have begun shutting downtheir own coal ports due to environmental concerns, thermal coal producers in Wyoming and Montana have simply diverted their product through Canada. Edited by Victoria Watcher, 24 February 2019 - 05:15 PM. Not to mention most of the crap we import on container ships come from factories with deplorable working conditions in countries with next to zero environmental and human rights regulations. That might explain why there’s been such an increase in freight rail traffic in recent years. Coal trains are routinely 100-120 cars long and run quite frequently. Last time I stayed in the Purcells a massive coal train went by where I was AirBnB’ing roughly 3-4 times per day. And that was out of only one mine. The people in my sphere just going off about the latest NEB report yet applauding the recent announcement from ferries to add 2700 more sailings per year on smaller and northern routes just slays me. Surely that’s not the only instance of glaring hypocrisy. 350 more tanker trips mean the end of the orcas. Meanwhile we continue to eat the orca's food and are adding thousands of ferry sailings. this province has a very long history - by both parties - of pretending to keep government hands off some things. only to have government hands on things. bc ferries. icbc. taxis/uber. bc hydro. all levels of education. resource industries. health. labour relations. policing. the list goes on. Edited by Victoria Watcher, 24 February 2019 - 06:15 PM. Just wait until Kenney is Premier. I have no doubt he will turn off the taps, if push comes to shove. property purchases and rentals. forgot about that. The AGBC has also filed an affidavit of Mr. Michael J. Rensing, Director of Low Carbon Fuels Electrical Branch in the Alternative Energy Division of the British Columbia Ministry of Energy Mines and Petroleum Resources. Mr. Rensing says that approximately 55% of British Columbia’s gasoline and 71% of its diesel is imported from Alberta refineries, the majority of which travels through the Trans Mountain pipeline, carrying an average of eight million litres per day of refined petroleum products from Alberta to British Columbia. The affidavit goes on to say that British Columbia cannot replace that supply from viable sources. It says that reductions in supply from Alberta will cause shortages in British Columbia and that the result could be increased prices, lack of supply and civil unrest in British Columbia. The affidavit makes interesting reading as to B.C.’s supply of gasoline and diesel fuel, and its dependence upon Alberta.